What Do Elections Tell Us About Switzerland and the U.S.? People are complaining; the authorities have admitted some mistakes were made; revisions are being considered. In the midst of the negatives - Isn't that what residents of Geneva are known for? - I would like to offer two very positive comments on the new organization from the perspective of someone who rode the New York subways for years. People here are not used to crowded cars; they are not used to standing and being bumped about. I lived with those realities for years. Positively, I have never been offered more seats in my life. In fact, although one does not like to admit being of a certain age, I am astonished at how many people have offered me places to sit down in the crowded cars. While it is somewhat embarrassing for someone who would like to think he doesn't need to sit down for a short ride, I find the politeness and consideration of the passengers to be exemplary. I have never witnessed this in New York subways. 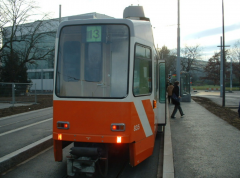 Although I do miss tram 13 and resent changing trams at Plainpalais - I refuse running since I am a firm believer, for the moment, that the trams will be more frequent - I am pleased to relay some positive notes on our new tram experience. What about December 11, 2011? One more year until December 11, 2012, which might be close to the end of the world ( la fin du monde), according to some people.